When thinking of photo editing software, there are only a few names that really come in mind. For me, there is Photoshop, ACDSee and, of course GIMP. Although the all of them work pretty good, each of us has his own preference, and for those of you who like to use GIMP for image editing, you will be thrilled to know that it is compatible with Windows 10, Windows 8. 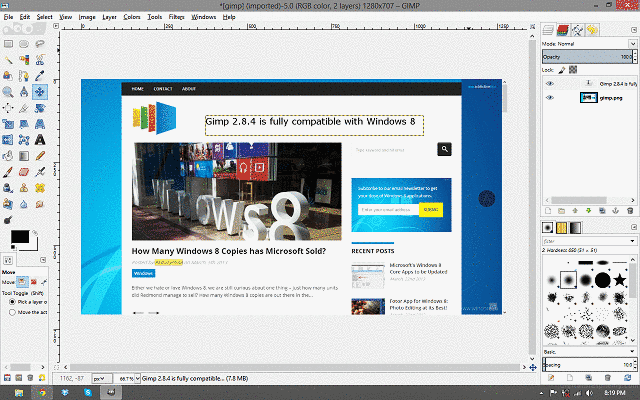 The latest version of GIMP is fully compatible with Microsoft’s new operating system, and it has also received many improvements from the last version, which had some issues. Also, as in terms of features it is comparable with Adobe’s Photoshop, but it is much more resource friendly, which makes for a great Windows 8, Windows 10 program. Keep in mind that unlike other photo editing apps like Fotor for Windows 10, Windows 8 or Fresh Paint , Gimp for Windows 10 Windows 8 is not an app, but a full Desktop program. This is the same one that is compatible with Windows XP and Windows 7, so if you were looking for a dedicated app, then you will be disappointed as there is no official app at the time of this writing. However, there is a GIMP Training app available on the Windows Store, for those interested in learning how to use GIMP . Moving on to the actual program, GIMP for Windows 10, Windows 8 is exactly the same as the versions for the old Windows operating systems. Also, for those who are just starting to use GIMP, you will probably have to watch a few tutorials before you start working. After installing GIMP on Windows 10, Windows 8, you will notice that it starts in multiple window format, which allows the user to move each element on the screen and place them where ever they want. While this feature is great for multiple monitor setups, I don’t think it is ideal for a single monitor. Luckily, this can be easily changed under Windows -> Single-Window Mode. The tools are pretty similar to Photoshop, allowing users of GIMP to create or edit photos very quickly and efficiently. Also, a difference I noticed when using GIMP on Windows 10, Windows 8 is the overall smoothness and speed with which images open and tools work. One of my favorite tools that GIMP for Windows 10, Windows 8 provides is the angle measurement feature, perfect for those who do precision work. GIMP also supports hundreds of plug-ins and scripts that give you access to an ever bigger list of image editing options. You can add new brushes to the tool, as well as new gradients, colors, patterns and splashes. You can check out the full list of supported plug-ins in the GIMP Plugin Registry. Perhaps some of the most popular GIMP plug-ins are Layer Effects and Layer via Copy/Cut. These two tools bring a useful feature from Photoshop into GIMP, allowing designers who work with layers to copy, cut and paste areas from one layer or a group of layers. You can also create new layers using the areas you previously selected. 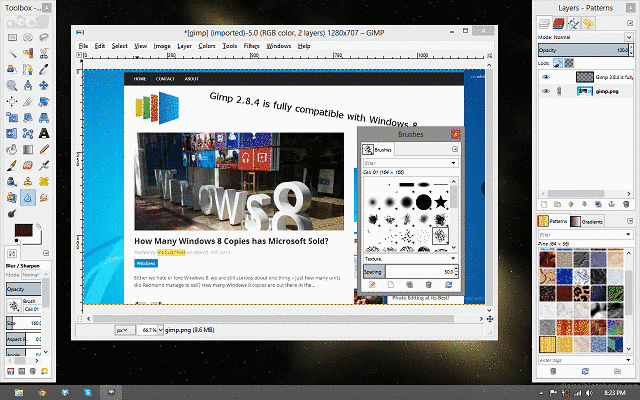 Overall, GIMP for Windows 10, Windows 8 offers all the goodies that users are familiar to, but with the added bonus of Windows 8 support and the speed that it has. Now you know that GIMP runs on Windows 10, Windows 8 without a hitch, which means that you can start editing photos just like before.